After cook it properly add coriander leaves to it. Fill the cone with 3 tablespoons of filling. Press this filling down with your fingers. Now close the top of this cone into a triangle shape, pinching the top edge so that it is completely sealed. After samosas are floating on top of the oil turn them slowly. 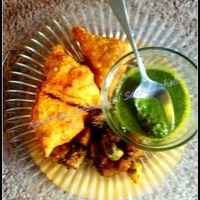 Outstanding recipe & a delicious appetizer (although I admit I could make a meal of samosas). Looks like you have a dish of mint chutney as a condiment. I enjoy a sweet mango chutney, too, and just a touch of hot chili in the samosa. However, your recipe should delight everyone! Thanks!